This book, "The Sinking of the Lisbon Maru: Britain's Forgotten Wartime Tragedy", is now available from Hong Kong University Press and Hong Kong bookshops. No reviews are yet available, but they will be posted here as soon as they appear. 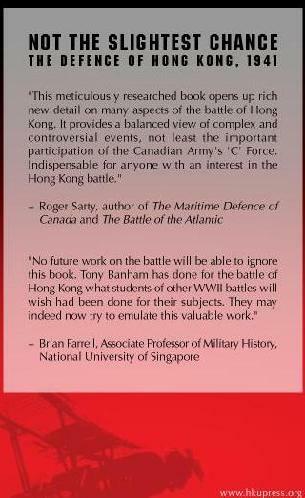 The original book in this series was "Not the Slightest Chance - The Defence of Hong Kong, 1941". This is a detailed study of the defeat of Hong Kong at Japanese hands in December of that year.